No life is tidy or made of whole cloth, and few form a more checkered fabric than Carl Sagan’s. Science writers Keay Davidson and William Poundstone have done a remarkable job of getting their minds around such a larger-than-life figure, given that both conducted their interviews, gathered their materials, and produced elegantly written narratives in the two and a half years since Sagan’s death on December 20, 1996. I read Davidson’s book first during a summer houseboat vacation in August, 1999. I had schlepped half a dozen books to read but started with the bound galleys of Carl Sagan: A Life and never got to the others because I couldn’t put it down. It’s a great read, revealing Carl’s life to be even grander than I thought. Yet Davidson pulls no punches in this “warts and all” portrayal of the great cosmic visionary. Poundstone’s Carl Sagan: A Life in the Cosmos will be favored by those who prefer its easy-to-get-around style of short subtitled sections that take the reader along a time/subject line of Sagan’s life. Although some reviewers have disputed some of the claims and charges made by the biographers (see, for example, Chris Chyba’s review in Nature), based on my personal knowledge of and research on Carl Sagan, I think both authors got the story right in its basics and captured the man in his essence. And if you can keep a dry eye during the death bed scene with Carl, Annie, his children and friends (the essence of which appears under Ann’s name as an epilogue to Billions and Billions), and Annie’s final words to her beloved Carl, and his to her and his children, I’ll personally refund your money for the book. I tried to read the final scene out loud to my wife but couldn’t get through it. The humanization of Carl Sagan makes him an even greater man than he was in myth and legend. But the problem of all narrative biography (and here I do not fault either author for not writing the biography I would have written) is in determining whether a particular action, a quote from a speech, an excerpt from a book, or a description of one’s subject by a colleague or friend represents a passing fancy or a deep interest, a whim or a passion, a long-term personality trait or a short-term temporal state (trait v. state theory in personality psychology). Was Sagan a tender-minded liberal or a tough-minded careerest? Was he a feminist or a misogynist? Was he really obsessed with the possibility of extraterrestrial intelligence, or was this just a flighty avocation that happened to generate a lot of media attention? Was he a scientist of the first rank or merely a media-savvy popularizer? How can we tell? 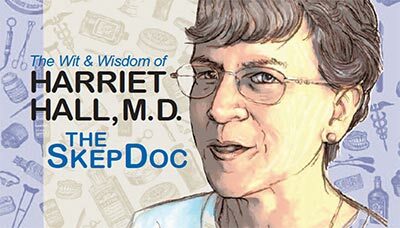 It is easy to start off with a hunch and then comb through books, papers, notebooks, diaries, interview notes, and the like, pick out the quotes that best support the hypothesis, and draw the anticipated conclusion. 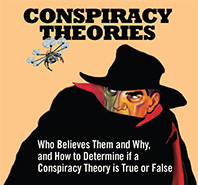 In statistics this is called “mining the data.” In cognitive psychology it’s termed “confirmation bias,” a powerful explanatory concept that accounts for many human thinking foibles where we tend to focus on information that confirms what we already believe and ignore disconfirming evidence (Nickerson, 1998). Or as I like to say about psychic readings, we remember the hits and forget the misses. How can we avoid the confirmation bias in writing biography? One way is to apply the tools of the social sciences. Fortunately for any would-be scientific biographer, Sagan’s curriculum vitae (c.v.) is, to say the least, comprehensive. Weighing in at 4.5 pounds, it totals 265 single-spaced typed pages. 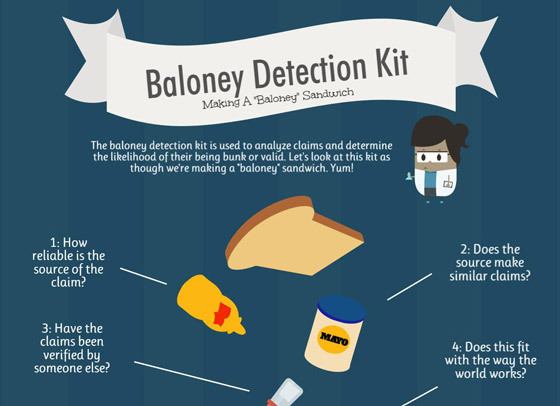 An analysis of it allows us to answer certain questions and to test specific hypothesis. For example, how productive a career did Sagan have? Figure 1 presents his 293 advisory groups, professorship and lectureships, and professional societies by type. Figure 2 displays Sagan’s 89 fellowships, awards, and prizes by type, offering insight into what he was most recognized for by society and his professional colleagues: first and foremost as a humanitarian and science popularizer, next for his scientific research, and last for his scientific writing (but one was the Pulitzer). Such data alone, however, tells us little without a context. Was Sagan a world class scientist or a mediocre scientist and a world-class popularizer? Since he was rejected by the National Academy of Science, the most prestigious scientific organization in America, I thought it would be instructive to compare Sagan’s statistics to those of the average NAS member. Unfortunately such comparative data are not available. But even by NAS standards Sagan was no ordinary scientist, so I decided to compare him to a handful of scientists who represent the créme de la créme: Jared Diamond, Stephen Jay Gould, Ernst Mayr, and E. O. Wilson. Sagan’s book production is also telling — in totality, in content, and in comparison. Figure 4 shows Sagan’s 31 books by content, indicating his primary professional interest in planetary science (from his first book in 1961, The Atmospheres of Mars and Venus with W. W. Kellogg, to Pale Blue Dot in 1994), as well as his pioneering efforts in the exotic science of exobiology and the (at the time) mildly radical SETI (from the classic Intelligent Life in the Universe with I.S. Shklovskii to Contact). Under general science I included such books as Cosmos and The Demon-Haunted World, and under the category of evolution fall The Dragons of Eden and Shadows of Forgotten Ancestors, co-authored with Ann Druyan and considered by Davidson to be his greatest work (because of her influence). But Sagan’s most controversial books dealt with the topics of nuclear winter, disarmament, and the environment, especially A Path Where No Man Thought with Richard Turco. Figure 5 shows that Sagan’s book productivity was the highest in my comparison group, out-generating Mayr by 10 in 35 fewer years, Wilson by eight in 10 fewer years, Gould by 11 in only five more years, and Diamond by 22 in the same time frame. 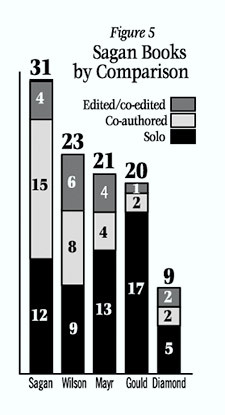 Interestingly, for all his alleged arrogance Sagan has the highest ratio of co-authorships and co-editorships of this elite group (eight of those 15 co-authored books had four or more authors or were large group collaborations, artificially inflating his book total but demonstrating his ability and willingness to work with others). 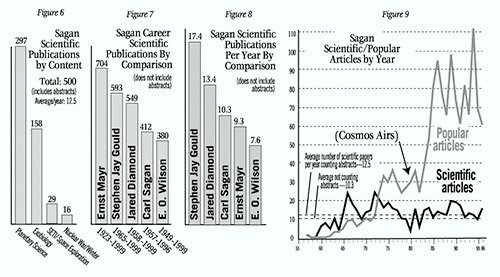 In Figures 6, 7, and 8 we get to the meat of Sagan’s c.v. — scientific output by content and in comparison. 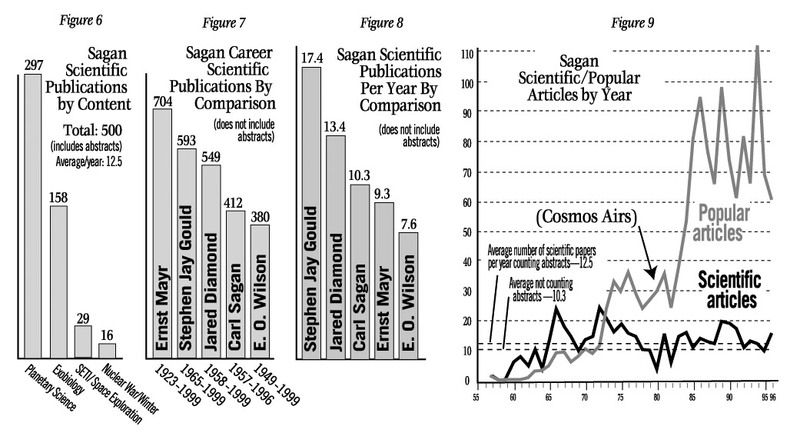 Figure 6 presents a content analysis I conducted on Sagan’s 500 published scientific papers, revealing that planetary science was by far and away his greatest professional interest, with two-thirds more than all other papers combined. 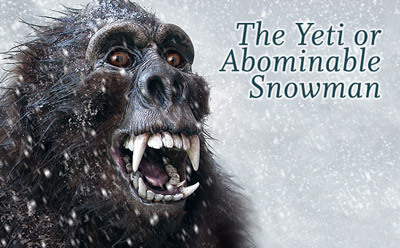 Nevertheless, nearly a third (31.6%) of the total were in the (then) controversial field of exobiology, and another 9% in such career-hampering fields as SETI and nuclear winter. To many scientists, these washed out Sagan’s remarkable 67 (13.4%) papers that appeared in the prestigious journals Science (37) and Nature (30). By comparison, Diamond had 13 in Science, 128 in Nature (with 120 of them as his regular “News and Views” column), and through 1996 Gould had 45 articles total published in Science and Nature. 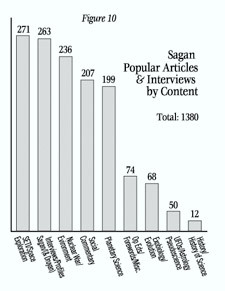 What Sagan was most famous for, and what got him in the biggest trouble with the academic establishment, was his Brobdingnagian outpouring of popular articles and interviews. 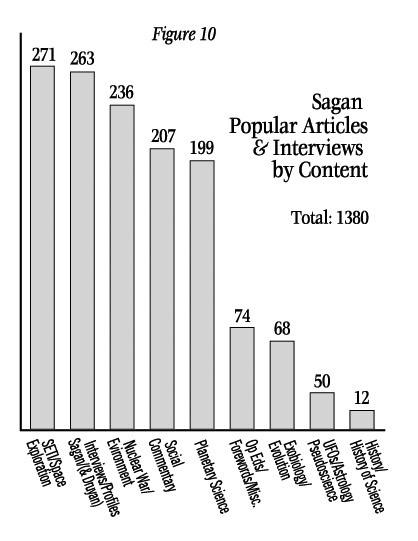 For Figure 10 I conducted an eye-blurring content analysis of all 1,380 items, revealing that public and professional perceptions of Sagan as the ET go-to guy were not misdirected, with SETI and space exploration topping the list. The number two most popular subject, interestingly and tellingly for this analysis, was Sagan himself, with no less than 263 interviews and profiles of the man (and many with his wife and professional collaborator Ann Druyan). Was Sagan politically and socially liberal? The data give us an unequivocal answer: one third of everything he wrote or said was on nuclear war, nuclear winter, environmental destruction, women’s rights, reproductive rights, social freedoms, free speech, and the like (and this figure does not include Op Ed pieces, which were not given titles in the c.v.). But in looking beyond the raw data one finds a definite tension in Sagan between his liberal/feminist ideals and his career ambitions. Although he was already a social activist in his early 20s, according to his first two wives Sagan was no liberal or feminist in the home. As Davidson described it: “Sagan’s liberalism, while sincere, had an abstract aspect; it was the clever, witty, after-dinner-speaker liberalism of Adlai Stevenson, not the passionate, heart-wrenching, take-to-the-streets liberalism of Martin Luther King Jr. Like so many aloof intellectuals, the young Sagan seemed to think in terms of People rather than people, of Humanity rather than humans” (113). Margulis recalled that Sagan “never changed a diaper in his life, he never cleared the table of his dishes, he never washed the dishes. … He needed ten thousand people to be raving about him all the time. I was just one young woman, trying to go to school and take care of kids and run a household. Every distraction he considered personal” (121). To be fair to Carl, however, it should be noted that after his death Margulis admitted to Druyan that she had been unfaithful in the marriage (a fact I confirmed with Lynn, but who also explained this was long after the marriage had gone sour for other reasons), possibly making Sagan’s lack of household egalitarianism, in conjunction with the cultural expectations of that time for men to be excused from such domestic duties, a little more understandable. His understanding of markets, which I had been studying, was simplistic. I remember being up at the Ritz Carlton…with his friends and his new wife [Annie]. Top floor of the Ritz Carlton, getting all kinds of perks — and they were going on about the virtues of communism. And that’s classic champagne socialism, you know?” Dorion wrote his dad a letter implying that his left-leaning economic views were hypocritical — a letter that was, Dorion admits, a pretext for his own inner hurts. “In the letter I said stuff like, ‘You say that we should have an equal allotment of wealth….Okay, why don’t we cap [the maximum allowable wealth] at your earnings last year and we call the unit ‘one sagan,’ and nobody can make more than one sagan. While we’re doing it, let’s cap the number of books that anybody can write (395). Along similar lines Poundstone properly nuances Sagan’s conflicting feelings about, and attitudes toward, homosexuality. When Dorion was in high school he befriended a gay classmate, triggering Sagan to sit him down for a lecture explaining that homosexuality was not how a species can propagate itself. Nevertheless, Poundstone gainsays Dorion’s stories (and we would do well to remember that, however understandable, Dorion still harbors a fair amount of ill will toward his father that may cloud his judgment) with examples of how Carl’s closest scientific collaborator, Jim Pollack, was openly gay; how Carl came to the defense of Pollack’s lover in a problem with obtaining treatment at the university health service emergency room, and that “in no visible way did Pollack’s homosexuality impede Sagan’s long and productive collaboration with him” (89). What made Sagan a pioneer in the search for extraterrestrial intelligence? To attempt an answer to this question Figure 11 presents data I culled from David Swift’s 1990 book SETI Pioneers. Not surprising, none believed that UFO sightings represent actual visitation by extraterrestrials. Equally unsurprising was their universal agreement that extraterrestrial intelligences (ETIs) probably exist somewhere in the cosmos (why else would they be involved in SETI?) I included these columns because, although interest in and the study of exobiology and the possibility of ETIs is certainly not mainstream science, then or now, it is nowhere near as fringy as belief in UFOs. In a way, SETI is elitist, UFOs populist; SETI is highbrow, UFOs are lowbrow; SETI is dominated by Ph.D. astronomers, physicists, and mathematicians, UFOs are predominantly the domain of non-credentialed amateurs. As revolutions go, SETI is on the conservative side. This observation will become important when we turn to the role of personality in science. 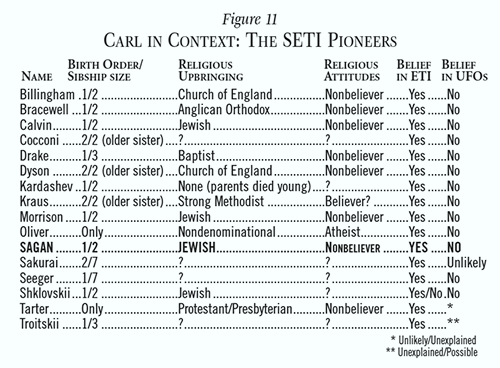 Swift asked each of the SETI pioneers about their parents’ religiosity, but oddly did not ask about their own beliefs. Nevertheless, I was able to glean most of that information from the interviews — enough to make the generalization that most were raised in a religious household but that not one believes in anything like the traditional Judeo-Christian God (although I am missing some data). What is the significance of this observation? Astronomer Frank Drake, ostensively the SETI pioneer if there was one (and creator of the infamous “Drake equation” for computing the probability of ETIs), who was raised “Very strong Baptist. Sunday school every Sunday,” made this observation: “A strong influence on me, and I think on a lot of SETI people, was the extensive exposure to fundamentalist religion. You find when you talk to people who have been active in SETI that there seems to be that thread. They were either exposed or bombarded with fundamentalist religion. So to some extent it is a reaction to firm religious upbringing” (Swift, 57). Similarly, John Kraus recalled: “We were very strong churchgoers, members of the Methodist church. I was brought up in a very religious atmosphere…there was never any thought of conflict between science and religion in my thinking or in my upbringing. Science and religion were simply both seeking ultimate truth but using different ways of going at it” (236). 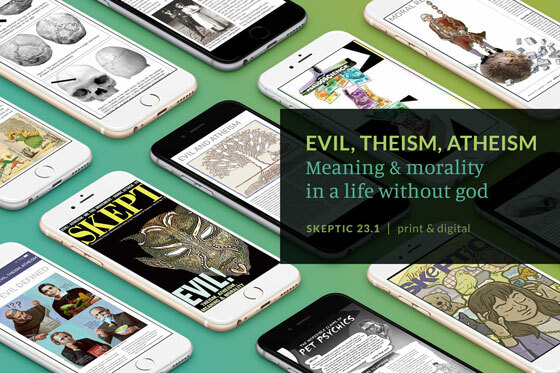 Does religion play a role in attitudes toward ETIs? Philip Morrison gave his considered opinion (28): “Well, it might, but I think that it’s just one of the permissive routes; it isn’t an essential factor. My parents were Jewish. Their beliefs were conventional but not very deep. They belonged to the Jewish community; they went to services infrequently, on special occasions — funerals and high holidays” (28). One might speculate that SETI, as a highbrow, elitist revolution, contains within it quasi-religious and spiritual overtones, in the sense that these scientists, while not believing in God, do believe in ETIs, uniformly portrayed as higher intelligences who, having survived what might be a tendency in species toward self-destruction once advanced technologies are created, must also be morally superior. To the extent that religion involves belief in and hope for transcendence or transcendent beings, SETI is a high-cultural form of religion, and UFOs a low-cultural form of religion. The left column in Figure 11 presents the birth orders and sibship size of each of the SETI pioneers. Swift identified an apparent overabundance of firstborns in his population, including Sagan. But is it a statistically significant overabundance? Swift did not test for this, but U.C. Berkeley social scientist Frank Sulloway and I did, applying what is known as the Greenwood-Yule rule for expected number of firstborns. 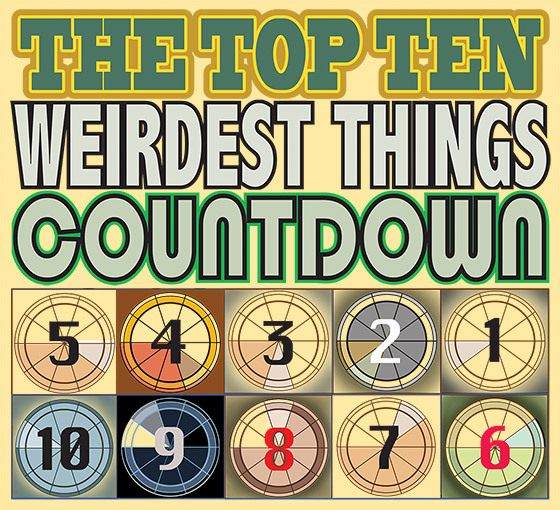 For the SETI pioneers eight is the expected number of firstborns based on the number of siblings they had, but 12 is the observed number. This difference (four) is statistically significant at the .05 level of confidence. Extroversion: Firstborns are more extroverted, assertive, and likely to exhibit leadership. Personal Influences: “Mentoring and friendship influence the adoption of radical ideas.” As a graduate student at the University of Chicago Sagan befriended Joshua Lederberg, whom Keay Davidson calls “the godfather of exobiology,” the meeting of which launched “the most high-profile dynamic duo of the early days of exobiology, the science of extraterrestrial life.” Sagan also worked closely with Nobel laureate H. J. Muller, and in 1976 wrote Lederberg: “if not for the encouragement by H. J. Muller and yourself, I might not have had the courage to seriously pursue what later has come to be called exobiology.” As Davidson described it: “The older scientist did more than talk; he escorted Sagan into the corridors of power.” Lederberg characterized the relationship as such: “I was often his protector and defender from folks who thought he was wild. He had a lot of offbeat ideas. They were always at some level not illogical, and some of them could prove to be right; and I would point out [to others] the value of listening closely to someone who has that degree of rigor and imagination at the same time” (89). Sagan’s high conscientiousness occasionally clashed with his high openness. Lederberg recalls: “He didn’t stick to things very long. I think part of his reputation for not being ‘solid’ has less to do with lack of rigor on any one item than that he didn’t build a body of work on one particular topic. His interests were so catholic” (Davidson, 90–91). Actually this is what Sulloway’s family dynamics model predicts. 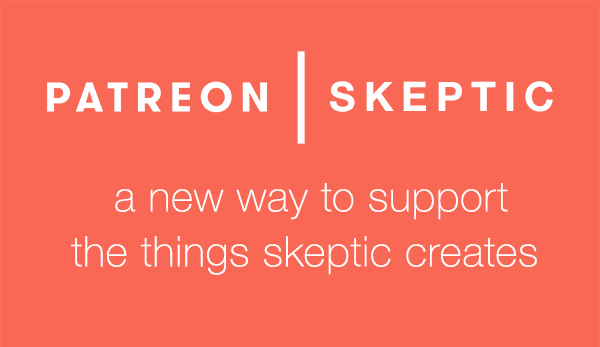 Sagan’s openness to experience led him to gamble on a number of revolutionary ideas, but his conscientiousness prevented him from taking these ideas too far into crankdom. To this context, in a 1998 study (Shermer, 1999) Sulloway and I found that openness was significantly correlated with lower levels of religiosity (r=-.14, p<.0001) and higher levels of religious doubt (r=.18, p<.0001). Moreover, openness was significantly correlated with change in religiosity, with higher openness scores being associated with lowered piety with increasing age (r=-.09, p<.01), as well as with lower rates of church attendance (r=-.11, p<.01). Not surprisingly, we also found a strong correlation between openness and political liberalism (r=.28, p<.0001). These findings gel with Sagan’s personality and attitudes toward SETI and religion, where he was a passionate believer in the former and a skeptic of the latter. He was not afraid of controversy, indeed, he seemed to thrive on it. Thus he advocated SETI when it was highly disapproved of by the scientific establishment. It threatened to abort his career because it was so disreputable. [Yet he] sometimes he went out of his way to insult his enemies even when it was irrelevant. E.g., once at a public lecture on space exploration for The Planetary Society, he attacked Republicans even though it had nothing to do with the talk and undoubtedly alienated a good part of the audience. He used his verbal skills to help him accomplish much more than most people could have, by dictating whenever possible. He kept two secretaries working full-time just transcribing his tapes…. To live with Carl and his father, Sam, was to witness the most tender and unambivalent father/son relationship I have ever known. I never once saw Carl be disrespectful or even slightly testy with his garment cutter father, or with mine. He adored Sam and tried his best to be as much like him as he could. 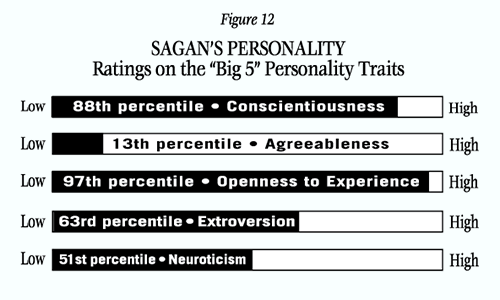 We square it by recognizing Sagan’s essential tension: between high conscientiousness and high openness to experience. No one is all of one personality trait all of the time. These traits are tendencies, and when they are in conflict we see such seemingly paradoxical behavior. But the paradox is resolved when put into the context of this personality dynamics model. Chyba, C. 1999. “An Exobiologist’s Life Search.” Nature. 28 October: 857—858. Davidson, K. 1999. Carl Sagan: A Life. New York: Wiley. Kuhn, T. 1977. The Essential Tension. Chicago: University of Chicago Press. Nickerson, R. 1998. “Confirmation Bias: A Ubiquitous Phenomenon in Many Guises.” Review of General Psychology. Vol. 2, No. 2, 175—220. McCrae, R. R. and P. T. Costa, Jr. 1987. “Validation of the Five-Factor Model of Personality Across Instruments and Observers.” Journal of Personality and Social Psychology. 52:81—90. McCrae, R. R. and P. T. Costa, Jr. 1990. Personality in Adulthood. New York: Guilford Press. Poundstone, W. 1999. Carl Sagan: A Life in the Cosmos. New York: Henry Holt. Sagan, C. 1986. Contact. New York: Pocket Books. Shermer, M. 1999. How We Believe: The Search for God in an Age of Science. New York: W. H. Freeman. Sulloway, F. 1996. Born to Rebel: Birth Order, Family Dynamics, and Creative Lives. New York: Pantheon. Swift, D. 1990. SETI Pioneers: Scientists Talk About Their Search for Extraterrestrial Intelligence. Tucson: University of Arizona Press. Tuchman, B. 1978. A Distant Mirror. New York: Knopf. During the last months of Dr. Sagan’s life, I wrote him a brief note (which I mailed to him at his University address). I will never forget him taking the time to write me, given the challenges he faced at the most difficult time of his life. By any measure you choose, Dr. Sagan’s life was a “milestone” for the human existence.